Just a little update tonight. 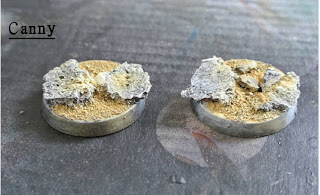 Finished the bases and quite pleased with the new purchase of pigments, I have watched a few videos about pigments and I have to say they have turned out pretty well. I picked up the Secret weapon Dry Earth set of 4 colours and here is the result. You may find this helpful I know I did. . ByPainted video about basing. How I did it, Black base coat followed by a heavy dry brush of VGC stone wall grey and then a lighter one for edges elfic flesh. then I went mad with the pigments mixing them on the base and getting some good trassitions, mainly darker tones to the middle and lighter around the edge to give some depth. Dont forget to seat the pigment I used satin varnish but you can also get pigment binder. Last but no least a celebration for Zab over at Almost perfec and a competition he has on his Blog for Movember.